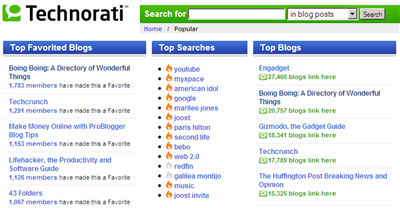 The Technorati Favorite Blogs list that showcases the top 100 most favorited blogs on Technorati (out of 75.2 million blogs) has now lost much of it's original charm. Ever since the "Technorati Favorites Exchange" meme gained popularity among bloggers, tons of relatively lesser-known blogs have managed an entry into the Technorati list displacing several popular bloggers including Dave Winer and Doc Searls. Even Jeff Jarvis, John Battelle and Gawker are on the exit route though guys like Michael Arrington, Darron Rowse, Merlin Mann and Frank Warren are still way up in the Technorati ladder. It takes almost 150 votes to get on Technorati Favorites list and that number is easy to achieve once you participate in any these Technorati link exchange programs. By swapping Technorati votes, you not only get to displace the legitimate members of the Technorati list (like the ones mentioned above) but your site even derives some Google Juice (read, backlinks) similar to the 2000 Bloggers project. That makes this Technorati Exchange meme all the more popular. To prevent users from gaming Technorati, what David Sifry and his team needs is a Digg like system - if the same set of users are mass favoriting similar blogs, step in. Else the list will soon lose credibility.